Rentals are available for half-day, full-day, and weekly, and include use of a slip for the rental boat at the marina. Half-day rentals are 4 hours, full-days are 8 hours (unless overnights are arranged in advance). Weekly rentals are for 7 calendar days. Advance reservations are recommended. All rentals include life jackets, lake charts, emergency bag, flotation cushions, and other safety gear as applicable. Gas and VT sales tax are additional to rental rates. Great daysailer, fin keel, newer main with reef points, genoa & jib. Small outboard for getting on/off dock. Large cockpit comfortably seats 4 or more. 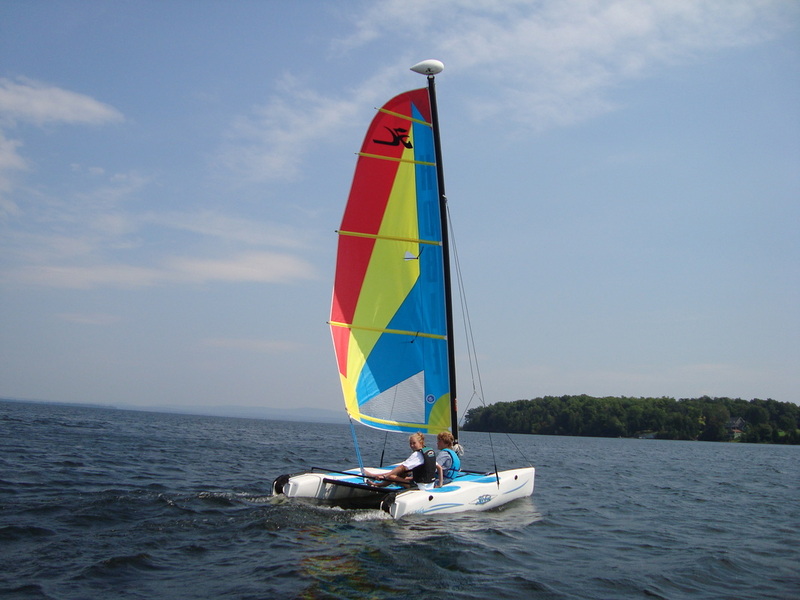 Fun catamaran sailing for 1-4 people. Fully battened main, without boom or jib.